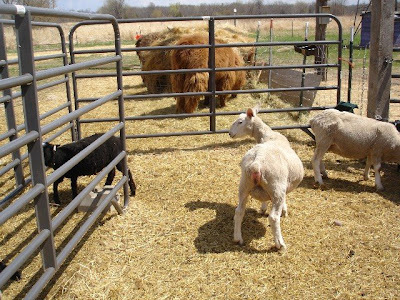 Roundabout Acres: Roundabout Acres' first Shetland Mule Lamb! Little Red Oak Lily is the (fiercely) proud mother of our first Shetland mule lamb out of Beechtree Dougal. The lamb is beautiful...and a boy! Oh well. 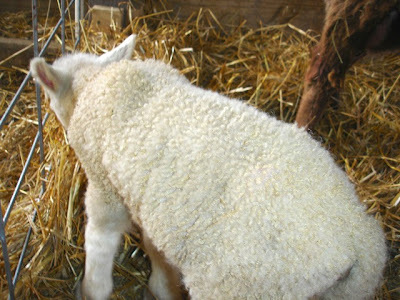 His fleece looks purly like his sire; he will make a great whether for a companion or fiber pet. He has the most lovely face and eyes. LRO Lily (moorit, scurred) is our "wildest" Shetland. She does not seek any attention from humans and she is extremely protective of her lambs. Last year she gave us a single white ram lamb with a big moorit spot. He had wonderful fleece but tight horns. He went to the freezer. So, this year she gave us another boy with fabulous fleece. At least, with the Mulesheep, we don't need to worry about horns. This big lamb weighed in at 10 lb. 7 oz. Below are a few pictures of Danny-Boy. 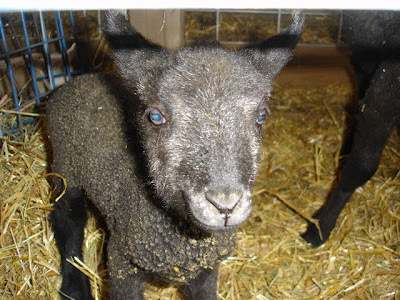 Also on Friday, our Mulesheep Maliah (from Psalm 23 Farm) gave birth to a black single ram lamb. Maliah is a very friendly ewe and she had no problem letting me handle her boy and stripping her teats. The BFL mules do have a HUGE udder! 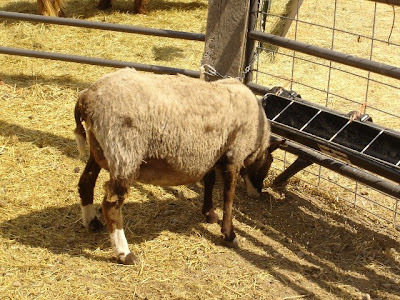 Her lamb should have no problem getting plenty of milk. He has white hair on his face and ears and a spotted nose; he is 1/2 BFL 1/4 Shetland 1/4 Cheviot. This boy weighed in at 10 lb. 3 oz. I don't know if I can get grey out of this combination and we have plenty of black right now; pending fleece evaluation, he will be a freezer lamb. His name is Lamb Chop. Enough said. And finally, I have to share a few pictures of pregnant ewes. 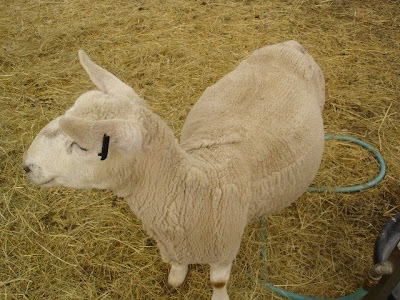 Cheviot ewe #7 is so wide and flat, her back is like a table top! I'm hoping she has two lambs in there. Her udder is filling more, so maybe she will lamb in the next few days. 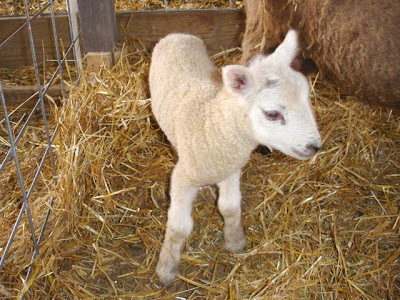 She is bred to BFL Dougal for BFL-Cheviot lambs. And below is Little Red Oak Bella, a moorit, HST ewe. Her bag is expanding and she is widening out. She is bred to BFL Dougal also. Hey Terri, congrats on your newest additions! Wow Danny Boy was BIG. I didn't weigh my lambs last year but Lily had a big boy last year also. And thanks for the reminder about the Cheviot Mules. A brain fade on my part... And I forgot what that judge had said about the Cheviot mules! I will have to think about the show!